I'm so happy my school set up a website on easyalumni.com - now it's really easy for us to keep in touch with my classmates!!" We have created several alumni websites for High Schools, Colleges and Associations. 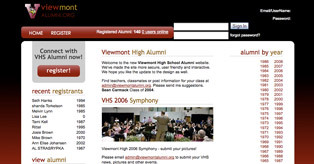 Viewmont has been using the system for a few years now, enabling the alumni to stay in touch. KpAlumni.org has over 2,000 registered users who all stay in touch using our effective yet simple alumni software.